The strobing trend (aka intense skin highlighting) may go away soon, but dewy, highlighted skin will never go out of style, so I wanted to show you the latest addition to my luminizer collection, the new RMS Beauty Magic Luminizer* and how it compares to the other RMS Beauty highlighters. In case you are not familiar with any of them, they are cream highlighters that, strategically applied on the highest points of your face (top of cheekbones, brow bone, bridge of the nose, cupid’s bow and inner corner of the eyes), give a beautiful glow to the skin and enhance the facial structure. 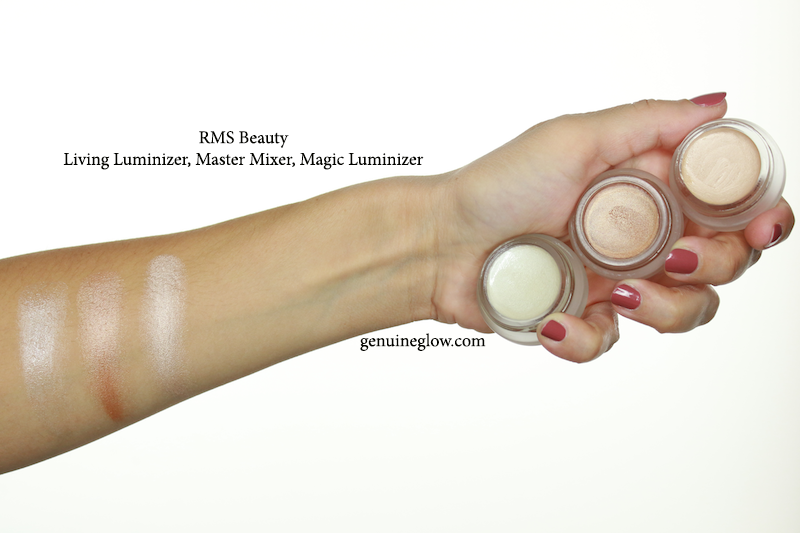 If you have used cream highlighters in the past, but you have never tried the RMS Beauty luminizer formula, the effect is similar to Benefit Watt’s Up and Nars Multiple Copacabana, but it is made exclusively with eco-conscious, almost edible ingredients. Describing a beautifully complex color like the Magic Luminizer’s is a bit of a challenge for me. The company calls it a “moon-lit, champagne opalescence”. It is a champagne color that leans warm, but has pink undertones. On my skin it looks like a true champagne color, but in the sunlight it looks warmer, more bronze-y. The shimmery pigments that create the radiant effect are very fine, so while the effect is super-luminous, it still doesn’t look like a cheap, chunky/glittery highlighter. The texture is creamy and soft, like a thick gel, with a bit more of a “grip” to the skin compared to the Living Luminizer. The product can be picked up with fingers or with a brush. 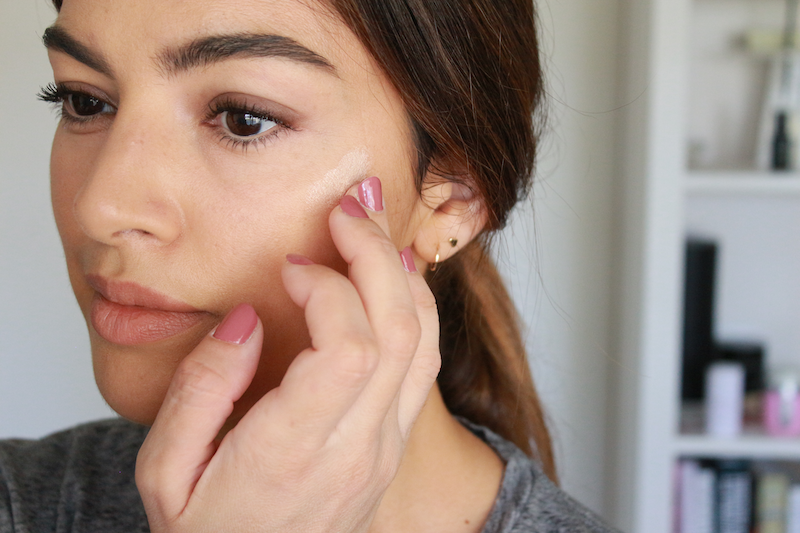 I like to swirl my (clean, for skin’s sake) finger in the pot and then dab it on the back of my hand so I can apply a tiny amount first. Then use whatever is left on the back of my hand to add more product, if needed. If you aren’t fond of using your fingers to apply makeup, RMS Beauty recommends using their new Kabuki Polisher brush*. I have tried the brush, and although I am more used to fingers, I do like how the Kabuki Polisher applies the product because it picks up just enough product and blends it nicely. So when I am not in the mood to get my fingers dirty with makeup, or when I am on the go, I use the Kabuki. Not to mention, it’s a retractable brush, so I can close it and carry it in my makeup bag. I wouldn’t say that you need the brush, but it is a good one, and pairs well with all the RMS Beauty luminizers. It is made with 100% synthetic, super-soft bristles. Also lovely for applying cream blushes. 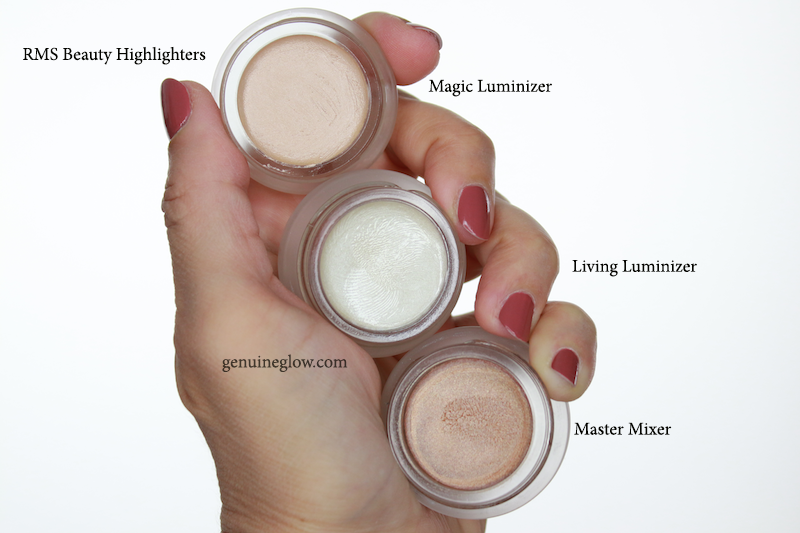 Talking about the other RMS Beauty luminizers, I wanted to give you an idea of how the Magic Luminizer compares to the other two (Living Luminizer and Master Mixer). 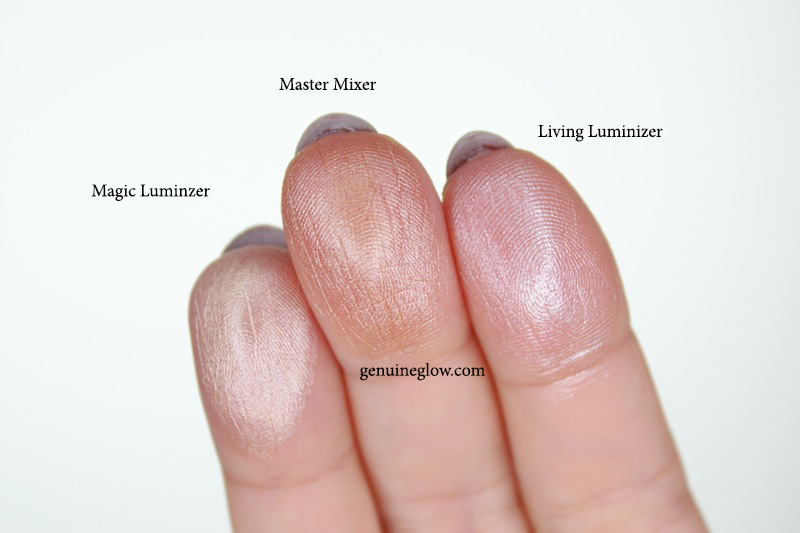 Color-wise, the Magic Luminizer is warmer than the Living Luminizer, but is not as warm as the Master Mixer. The Living Luminizer is like a translucent, pearly gloss, while the Magic Luminizer is a champagne, high-impact polish, and the Master Mixer is a rose gold color that blends in with the color of the skin and looks like a natural, lit-from-within, subtle sheen. Texture wise, the three products are very similar, however the Magic Luminizer appears to be more pigmented and have a bit more coverage. It can still be applied lightly for a more subtle effect, but it can be built up. 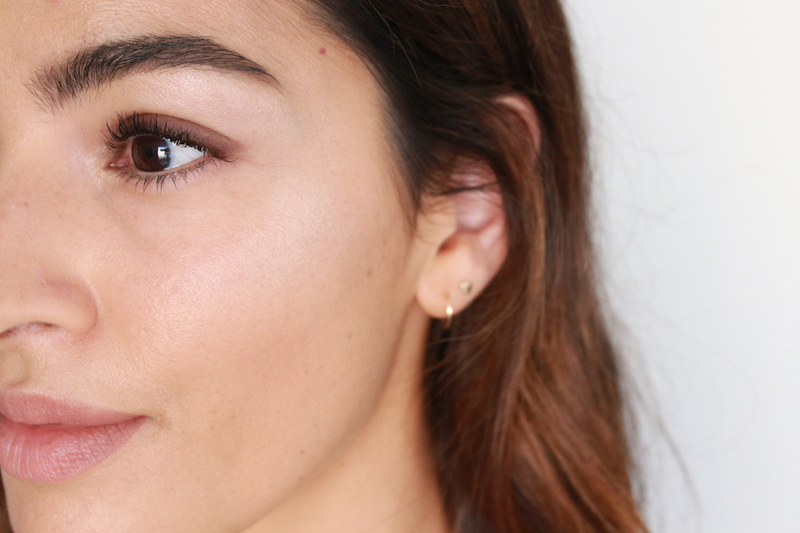 If you like your highlighter to “pop”, the Magic Luminizer is the best of the three. 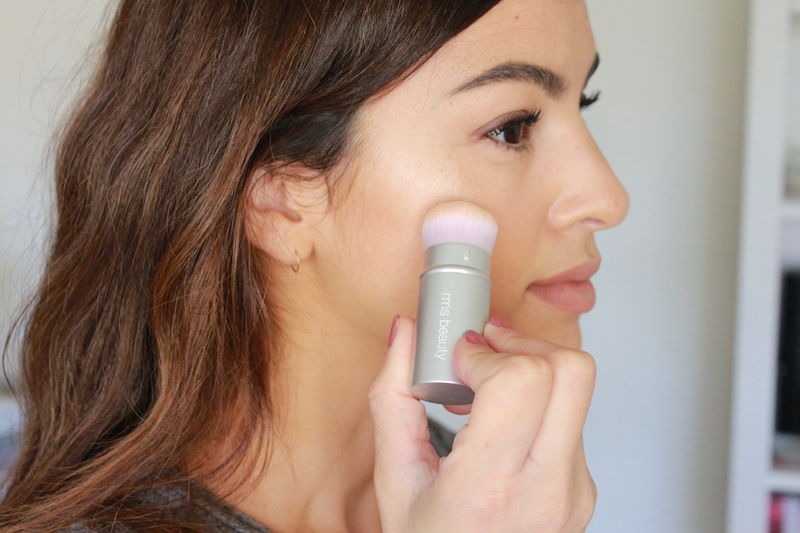 If you love the Living Luminizer but you wished it was slightly warmer, then you’ll love the Magic Luminizer. 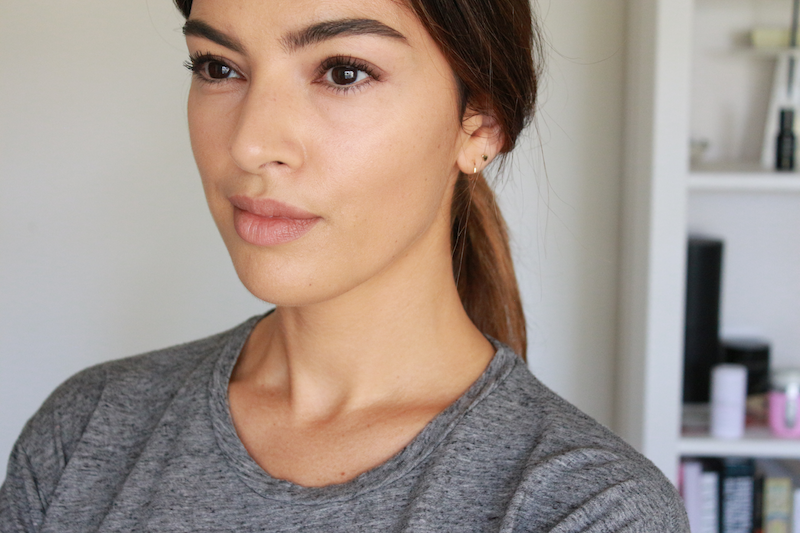 If you like to look like you have no makeup on but still want a natural-looking sheen on your skin, then I would recommend trying the Master Mixer. You can also see more swatches here. 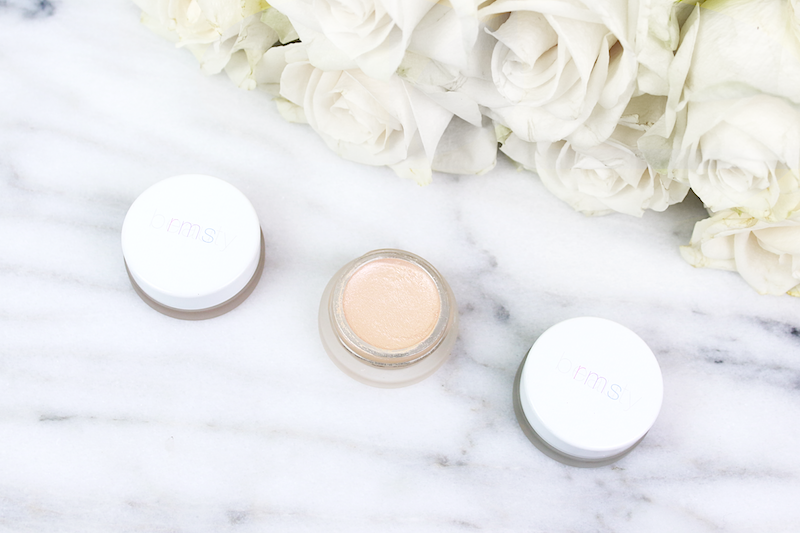 One thing for sure, RMS Beauty has the prrrrfect formula for cream highlighters. Depending on your skin tone and preferred effect, and unless your skin has issues with coconut oil, one of these will most definitely be for you. 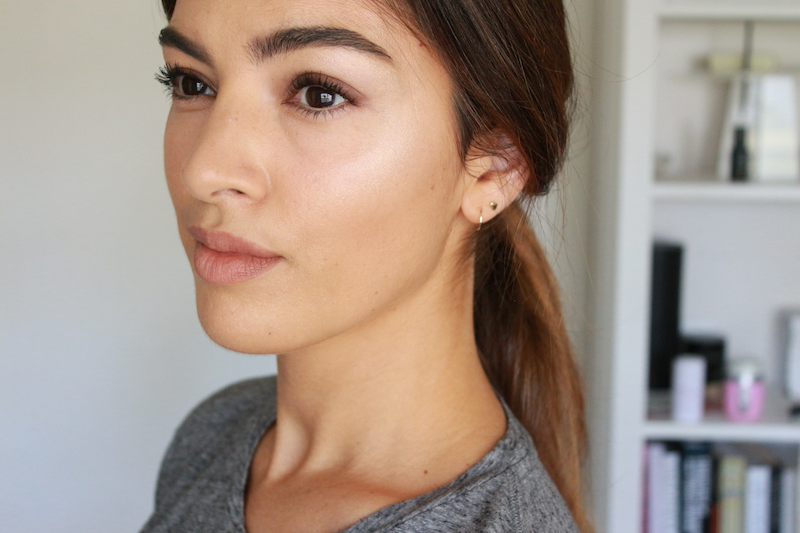 Personally, I like to use the Master Mixer for the daytime under or over foundation, or even on its own on a good skin day, but I find the Magic Luminizer to be perfect for the evening and special occasions, because it really makes the high points of your face pop, in the most gorgeous way. In fact, although it is a more high-impact highlighter that can build to an intense level of sheen, it still makes the skin look expensive. This is especially true if used with minimal makeup, letting polished skin be the focus of the entire look. If you know that you know that coconut oil isn’t for your skin, then I do have a few recs for other beautiful, coco-free highlighters. You can check out the ILIA Beauty Illuminators, which come in three shades: for fair skin (“Polka Dots and Moonbeams“), light to medium skin (“Cosmic Dancer“), and dark skin tones (“Sway“, reviewed here). You could also check out the W3LL People Bio Brightener Stick, (review here), which is very similar to the Living Luminizer in color, and so best suited for lighter skin tones. 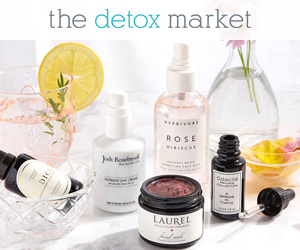 Due to its slightly drier consistency it’s a better option for more oily skin types. 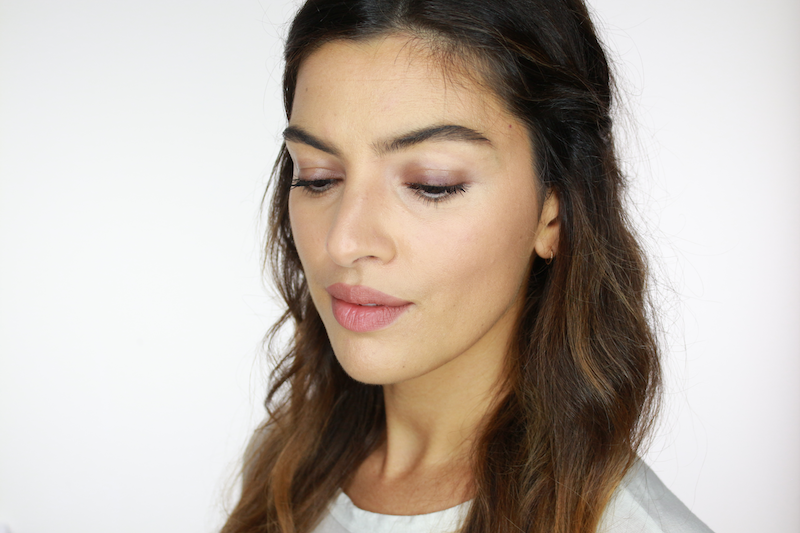 You can also check out the Kjaer Weis Radiance Highlighter (even the one and only Lisa Eldridge is a fan of it!! 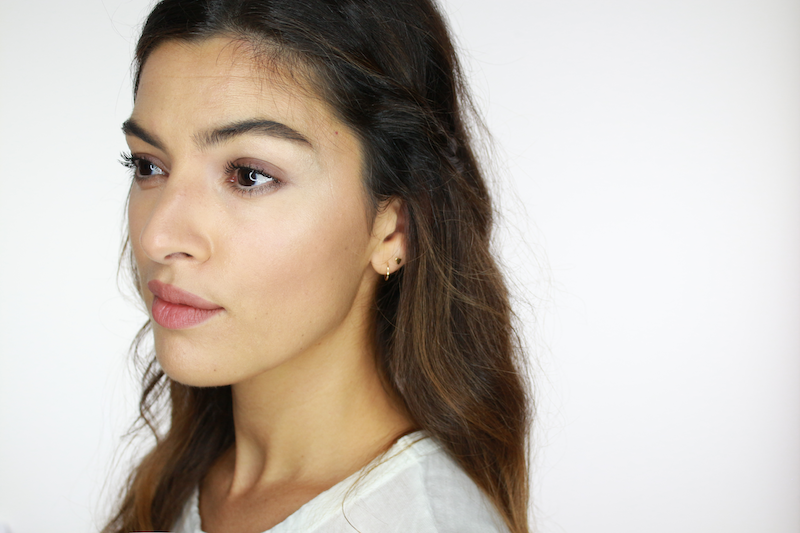 ), which I reviewed here, and finally, take a look at the Vapour Beauty Halo Illuminator, which offers a more subtle and sheer glow. So if you can’t do the Luminizers, you still have options. I have cut a little deal for you. 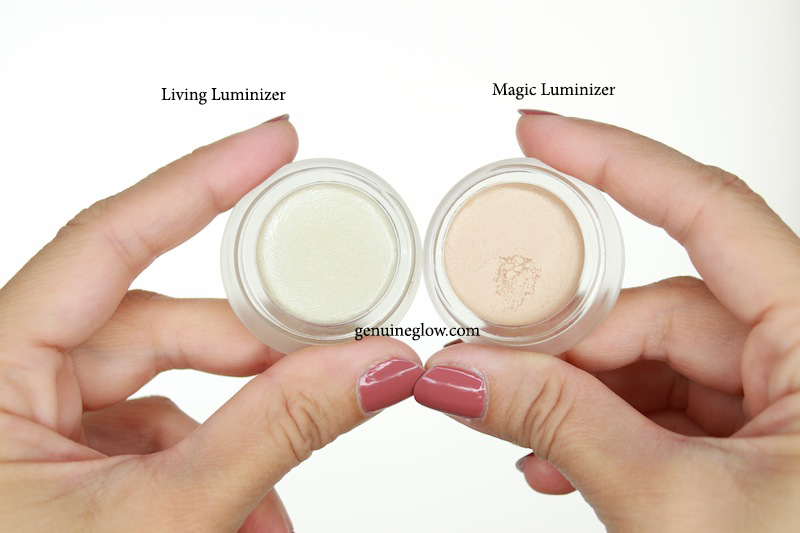 Purchase the Magic Luminizer here, and the code LILLY will save you the shipping fees :) Enjoy and get your glow on, people. The Holidays are just around the corner.